The 112th Millrose Game’s featured event was the NYRR Men’s Wanamaker Mile. 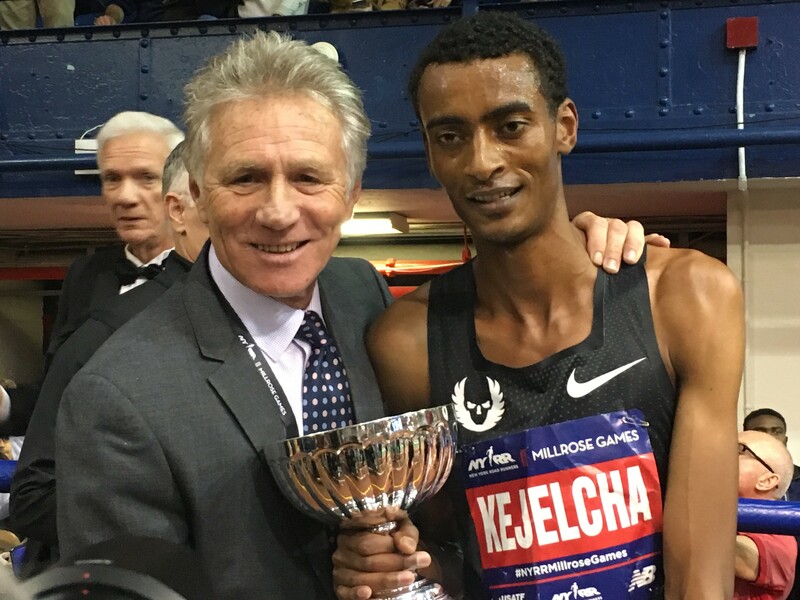 Yomif Kejelcha fell 0.008 seconds short of the indoor mile record, winning the Wanamaker Mile in 3 minutes, 48.46 seconds. Yomif was ready to run the first sub 3:48 indoor mile and he almost did it. He ran even pace with his slowest 200m being 29.21 before running his final one in 28.33. He was all alone the last few laps breaking the tape in 3:48.46. The world Record is 3:48.45. Kenya’s Edward Cheserek placed a distant second clocking 3:53:29 just ahead of USA’s Clayton Murphy 3:53:30. Both Yomif and Clayton are part of the NIKE Oregon Project. Donavan Brazier wanted Johnny’s Gray’s indoor 800 American record of 1:45.00 set March 8, 1992. He got it today as he clocked 1:44.41.